What Is It Like to Be a Guy With Fibromyalgia? | Troy C. Wagstaff aka CallahanWriter Blog: Topics of interest include Western Historical (1865-1899) Topics. Additionally inspirational Christian and Fibromyalgia interests. What Is It Like to Be a Guy With Fibromyalgia? 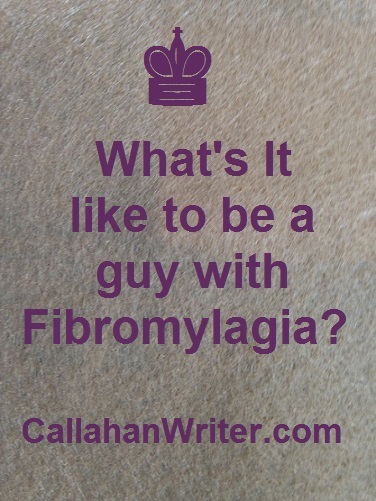 Why is it an issue to be a guy with Fibromyalgia (Fibro) as opposed to a gal with Fibro? It is a well-established fact that the vast majority of Fibro patients are women. Many studies have been done on the topic of gender and Fibromyalgia and they all turn out similar results. Statistically, of all reported cases of Fibro, 90% are women and 10% are men, one study indicated 85% women to 15% men. What man wants to have a woman’s disease? “I don’t.” But I have it, so now I have to deal with it. What person wants to be sick? No one. When you are, you deal with it. This hideous, bone crunching chronic pain disease is not for the faint of heart. But when you get it, you often feel faint of heart. With this disease I suffer debilitating chronic pain throughout my body, sometimes all at once, sometimes just a few parts of my body. Since last Friday, I have had an overwhelming pain in my left knee. I have also had a line of pain that goes horizontally in the small of my back that feels like a fold. Meaning that if I bent over to far I would fall into that fold. It feels a lot like my knee, bone on bone. Throw in neck pain and muscle spasms all over my back. That’s what the last three and a half days have been like. Before we go any farther, to those who don’t know what Fibromyalgia (Fibro for short) is, it’s a pain sensitivity that affects all soft tissue in the body. It does not affect the joints. However the muscles, tendons and ligaments are affected by Fibro which in turns affects the joints indirectly. Most people associate Fibro with chronic pain. If you do then you’re right but there is more to the story than chronic pain. There are countless web sites that mention all the primary and secondary symptoms of Fibromyalgia. I’ll only mention the ones that bother me the most. Fibro fog is the name of a small collection of symptoms that affect memory and cognitive functions. You’ve heard of people looking for their glasses only to find that their glasses are on top of their heads. Sometimes their glasses are right on their nose. Everyone has forgotten something important that they never dreamed they would forget. Have you ever been speaking and in mid sentence forget the word you were going to use? You know what the word means and you can describe what the word means but you can’t think of that word? Have you ever gone into a room to find something and forget what you’re looking for? All of these memory items and more are what many Fibro-suffers go through many times in one day. What’s worse is going into another room to take a pain pill because you are hurting. You get to the other room feeling that searing pain but you forget what you went in that room for. You go back to where you came from only to realize you needed a pain pill. Day in and day out, these cognitive issues wear on you heavily. There is also a foggy sensation in your mind that makes you feel like you are not all there. How many of you have suffered itchy sensations from allergies? How many of you have suffered those same types of skin irritations without any allergies? Welcome to my world. When I was first diagnosed with Fibro, I thought I was completely fatigued due to all the pain sucking the energy out of me. Pain can do that but so can Fibro. Fibro ebbs and flows. When I am having a relatively good day, I can still feel fatigued because it is just another independent symptom of Fibro. I could go on for several pages about my pain and symptoms but I have done that already in other posts here in CallahanWriter.com. Because of Fibromyalgia I am severely limited to what I can and cannot do physically and even mentally with cognitive functions. I can’t support my family which I have done for twenty of the thirty years of marriage and family. I can’t lift heavy things. I can’t lift light things that are awkward. I have sensitivities to sunlight and UV rays which affects being outside. I wear sunglasses almost everywhere I go. I tire easily so I have to pace myself. All of these issues and symptoms of Fibro affect my interaction with my family, my Church, my old hobbies and activities. I am a different person in many ways since Fibromyalgia came along. I have a very kind neighbor who mows my lawn every week all summer long. He and other neighbors shovel the snow on my driveway and side walks. I truly and deeply appreciate my neighbors but I also feel a deep resentment to my health for sidelining me from the physical activities of life I enjoyed so much and took for granted all those years. I still think almost the same as before, but not completely the same. I have to entertain limitations when I make plans. I have to pace myself on good days so that I don’t overdue it, and have to pay for the fun the next day in agonizing pain. I’m not looking for sympathy. My health could be worse. I just want people to be aware of how Fibro affects its victims including men. For me, I feel like a bum not being able to provide for my family. I feel like a bum when others have to do for me the things I no longer can do. I am in many respects a different person. I need to reinvent myself and that’s what I am working on at this time of my life. I have to plan a future that allows for countless sick days and chronic insomnia. I have to adjust to a day of unknowns. I can wake up in the morning feeling great and by lunch time I am in writhing pain only to feel better by nap time. These kinds of changes can happen four or five times a day or last all day or not bother me on rare days. Try planning with those limitations. I’m a stubborn and traditional person and I find it defeating when I don’t feel like a man. Sometimes I feel like a blob on the recliner taking up space. Once in a while I go to bed gratefully for a semi normal day. Yes, it really is that dramatic. Troy Wagstaff © All Rights Reserved, May be used by permission only. I so hate the fog!! If something isn’t in plain sight I forget about it….doesn’t matter if it’s bills, crafts I am making or meals I am planning, laundry etc. This has plagued me for years…..making me seem to always be in a mess. I get distracted easily and forget what I’m doing. Organization is not my friend. I am trying, but after several days, 30 minutes a day, of trying to organize my craft room….I found myself in bed all day today, aching all over just feeling rotten. I have only heard of one other guy with Fibro and it was very hard for him to be the provider for his family, his wife was very supportive but she told me of stories how other’s had a hard time believing he was so sick….many thought he was making it all up. I had about 2 years that were my worst. I found things were better when I stopped beating myself up so much for being sick and just tried to find peace with myself. Hang in there Troy! Great article. I am glad that you wrote this as it may help other men who suffer from this terrible disease (yes, I have it too). i know the feeling only too well of not being the person you once used to be. Take care. So great to see a man telling his fibro story – not great that you have it though! I agree with all of your sentiments even though I am a woman and not the main bread winner and I agree that pacing is so important and one of the main things I have had to learn for myself with this pain syndrome, Thanks for sharing at Fibro Blogger Directory facebook page, much appreciated. Yes, of course. Please send me a link when you make that post. I’d like to read your blog. The fog is the worst, especially when I’m trying to blog about something and can’t find the words I need. Very frustrating. The worst fog for me was once when I completely forgot to get my son from school. He patiently waited for 30 minutes before calling home. Felt like the worst parent ever in that moment. Now I have reminders and alarms on my phone for everything. I understand that men and women have Fibro fairly equally, but men are far more likely to self-medicate and far less likely to discuss it with a doctor… so the “reported” numbers make sense… but this is not specifically a woman’s disease.